Every summer I spend a week or so on the coast of Maine, and during that time one of the tasks I assign myself is to eat as much local crab, called Peekytoe, as I can get my hands on. Peekytoe crab, which has only just become popular outside of Maine in recent years, originated as a byproduct of lobstering. For years, lobstermen's wives would pick and sell the crabs that found their way into their husbands' traps. The crab meat was popular among locals but considered somewhat pedestrian. But the flesh of the Peekytoe (closely related to the Jonah crab) is one I've come to crave more than any other kind of crab meat. It's sweeter, less dense and more delicate than that of the Maryland Blue Crab or Alaskan King Crab, and it makes a superlative crab roll. When I tire of crab rolls, crab salad, crab cakes and crab "toasties" (crab salad and a slice of tomato on an English muffin, showered with cheese and then quickly broiled), I make this crab dip. It's perfect for company, and it takes a grand total of five minutes to throw together, plus 20 more in the oven. Which leaves you just enough time to change your clothes and fix some drinks! 1. Heat the oven to 350 degrees. Check the crab meat for shells, being careful not break it up too much. 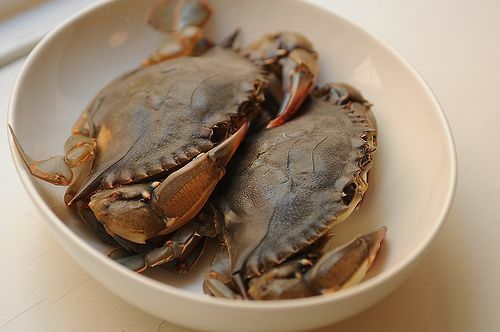 Squeeze handfuls of the crab meat gently to get rid of any excess moisture and set aside in a medium bowl. 2. In another bowl, combine the mayonnaise, cream cheese, mustard, creme fraiche, 1/4 cup parmesan, cayenne and salt and pepper to taste. Stir until smooth. Stir in the scallions and gently fold in the crabmeat until just combined. Taste and add more salt if necessary. 3. Spoon the crab mixture into a shallow oven-proof serving dish. Sprinkle more parmesan over the top to cover, followed by a dusting of paprika. Cover with foil and bake for 15 minutes, until warmed through. Uncover the dip, turn on the broiler and broil until the top is golden brown, watching carefully. Let sit for a few minutes to cool slightly before serving with water crackers, Triscuits or toast points.